Poland's state company PGNiG signed 24-year deal for US LNG from American supplier Cheniere. PGNiG says US LNG is 20-30% cheaper than Russian gas. ^Damage done to Russia economy will live on long after Putin. Two Ukrainian parties that cater to former Party of Regions electorate - Maidan skeptics & Russia sympathizers - have decided to merge. Leaders pledged to turn Ukraine into a new Switzerland, with emphasis on neutrality. Yuriy Boyko, co-chairman of the Opposition Bloc Party, and Vadim Rabinovich, leader of the Zha Zhitya Party, signed an agreement on the creation of an Opposition Platform Zha Zhytya. Boyko and Rabinovich stated this on November 9 on the sidelines of the Verkhovna Rada, noting that they invite all opposition forces to unite on the basis of their platform. Ukraine will hold its next presidential election on 31 March 2019. Parliamentary election is scheduled for 27 October 2019. ^Only 4 1/2 months to Ukraine Presidential election. Little longer to see if far right wiped out of Parliament. Stepan Kubiv, First Vice Prime Minister, the Minister of Economic Development and Trade, presented an offer to start consultations during his visit to Beijing at the meeting with Liu He, Vice Premier of China’s State Council. The Ministry of Economic Development and Trade informs that in eight months of 2018, trade between Ukraine and China increased by 21% and made around $6 billion. Now, the negotiations on free trade zone with Israel are on a final stage. REC....Just wondering do you per chance live near an Ocean or by the Sea...? Or have you at any time lived near large water expanses? I have heard about this strange theory the other day and im seeing if it has any validety to it.. I live on reclaimed land 0.5 mile from the sea. It will all be gone one day. The Bristol Channel has the second highest tidal range in the world (49 feet), only exceeded by the Bay of Fundy in Canada. 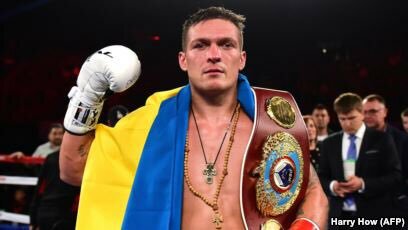 Big win last night for Ukraine and Ukrainian boxer Oleksandr Usyk, who is from Crimea and left the peninsula after the Kremlin’s annexation, as he defeated Russia’s Gassiev in Moscow. 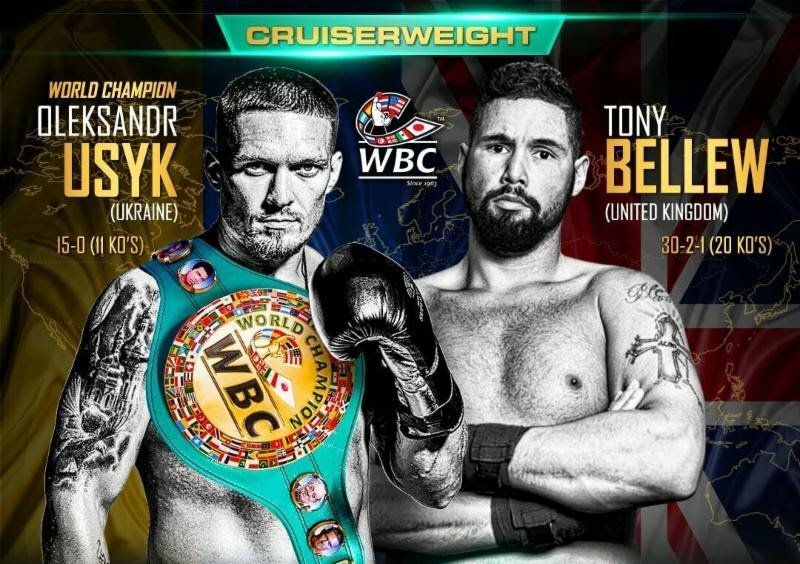 Having beat the Russian champion in Moscow, he fights the British champion in 2 months in England. I am sure he will will win. Ukrainian champ fights the British champ tomorrow in England. Russian fans got to enjoy a Ukrainian style ring walk. Hope the British fans get to see it too. Real local elections in eastern Ukraine would be monitored by @osce_odihr and would comply with Ukrainian law and @OSCE standards. The Nov. 11 sham “elections” – for fictitious entities backed by Russia – satisfy none of these conditions. The boxing was great but there was no Ukrainian rap music, no anthems, and no Cossack dancers as he usually has at his fights. I'm sure English fans would have enjoyed some ukrainian rap. The Ukrainian fighter won as expected. "People are happy to go to vote, it's a real democracy here," Jan Penris, Belgian MP from a Flemish nationalist party & ally of Golden Dawn, says of the Donetsk election, which is essentially a one-candidate race. Vlaams Belang is a reconfigured version of Vlaams Blok, which dissolved after a trial in 2004 condemned the party for racism. The Vlaams Blok then refounded itself as Vlaams Belang, with some changes to the more controversial portions of its statute. It has since sought to change its image from a radical to a more conservative party, and has distanced itself from some of its former programs. In Belgium in 2001, Roeland Raes, the ideologue and vice-president of Vlaams Blok, gave an interview on Dutch TV where he cast doubt over the number of Jews murdered by the Nazis during the Holocaust. In the same interview he questioned the scale of the Nazis' use of gas chambers and the authenticity of Anne Frank's diary. 24 Nov 2016 - The Greek Nazi organisation publicised more photos from the meetings of Vlaams Belang and Golden Dawn in Lesvos and Chios. Is Jobbik back on the pro-Kremlin track? 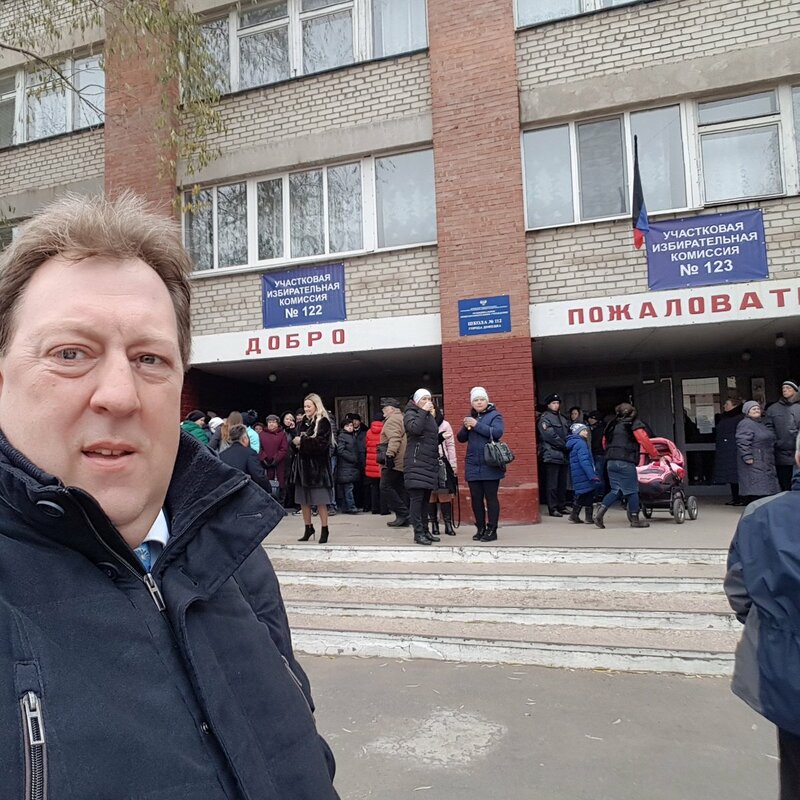 A Hungarian individual named Tamás Samu is "observing" the "elections" in the LPR today. "Tamás Samu" is also a name of one Jobbik's politician. In May 2011, the Metropolitan Court sentenced to 10 years' imprisonment for a two-year suspended sentence because of the violence against an official. He resigned his parliamentary mandate on 11 May 2011 after the judgment. In May 2008, met with European Parliamentarians in Strasbourg and chairman of the British National Party in London. Marton Gyöngyösi of the far-right Jobbik party called in parliament for Hungarian Jews to be catalogued and screened as potential national security risks. The British National Party (BNP) is a far-right, fascist political party in the United Kingdom. In Brussel organizing neo-Nazis from Nation en Euro-Rus a small demonstration for European-Russian solidarity. Syria is the main theme of the demonstration, and there are also some Dutch site. 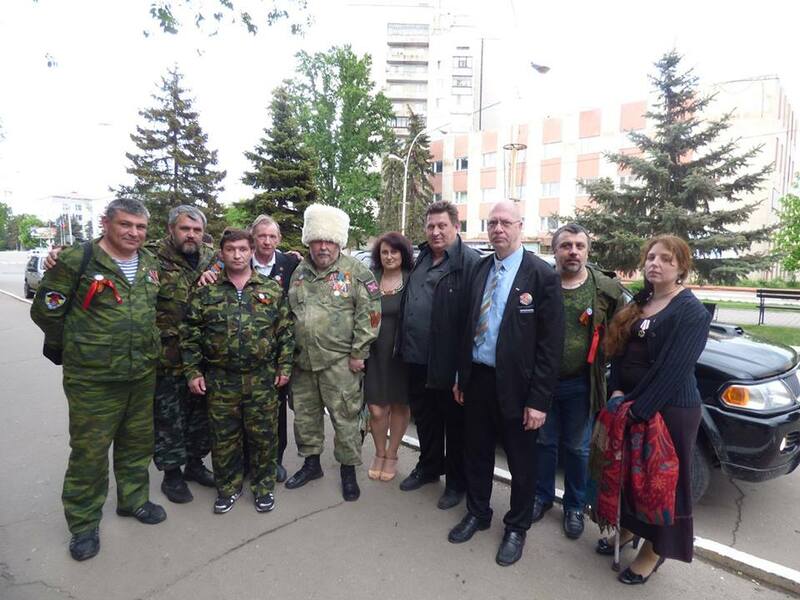 2016 - Belgian convicted racist & neo-Nazi, Kris Roman pops up in Lugansk. 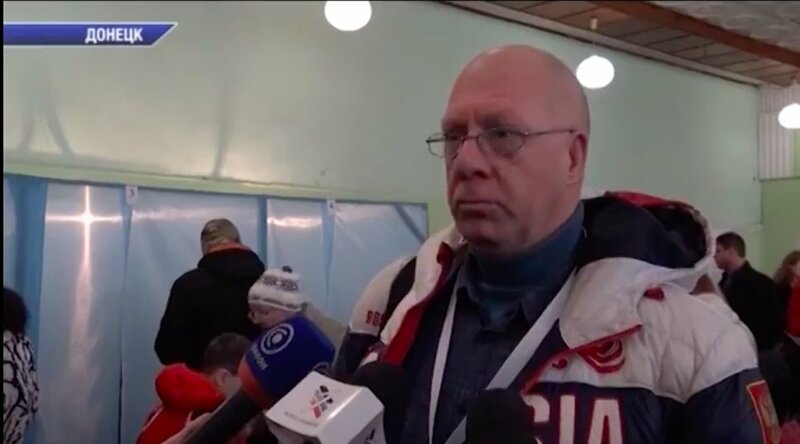 Euro-Rus is led by the Belgian neo-Nazi Kris Roman. The 50-year-old Roman has a good history within the Belgian extreme right. Later he twice acceded ex-'Grand Wizard' by the Ku Klux Klan, David Duke, to Belgium. Furthermore, Roman was sentenced to 9 months conditionally for publishing racist texts, and he spoke at meetings of the Dutch People's Union, among which one in honor of the 110th birthday of Adolf Hitler. 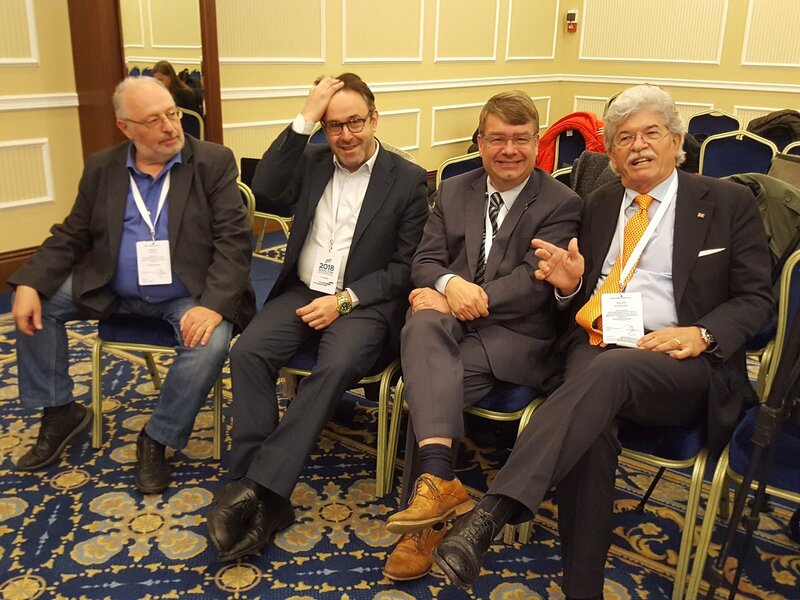 Also "observing" is Gunnar Lindemann, an AfD member of the Berlin State Assembly. The Tagesspiegel reports on xenophobic remarks by Lindemann in social networks and his membership in groups in which nationalist and anti-Semitic content would be shared. According to taz , Lindemann has proven links to the right-wing extremist spectrum. WARSAW, Poland (AP) — "Poland’s president, prime minister and other top leaders led an Independence Day march Sunday that included members of nationalist organizations, the first time Polish state officials have marched with the far-right groups." 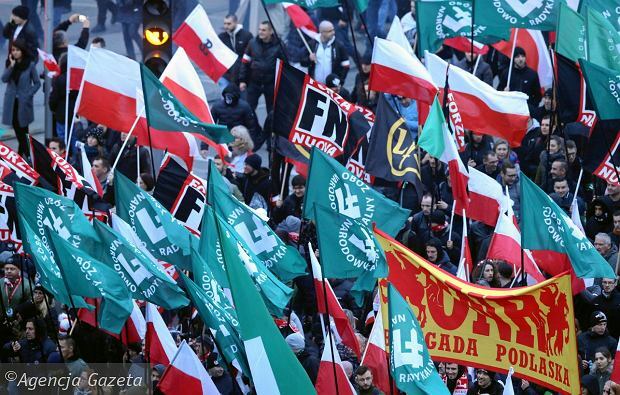 Telegraph, with a Reuters story: "Poland's eurosceptic leaders marked a century of national independence on Sunday as around 200,000 people marched through the capital in a parade involving far-right groups and neo-fascist activists from Italy."